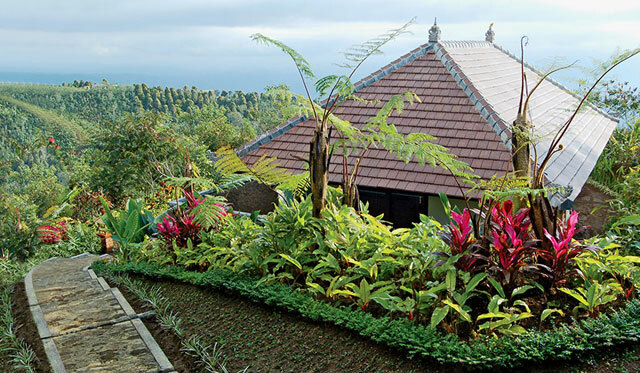 GETTING THERE The two-hour drive from the Denpasar airport to the northern mountains of Bali can be either a cultural pleasure or a Third World pain, depending on the depth of your travel fatigue. Best to let the resort arrange airport pickup so you can take in the sights. The back roads of Indonesia are beautiful once you peel your eyes from the death-defying scooter traffic. BEST MOMENT When the staff lights the nightly bonfire against a panoramic sunset and you see the first star reflected on the infinity pool. You're above the city lights. Above the clouds. Above the noise, the traffic, the jungle, and the hair dryer you forgot to pack. The universe fades to ether. WORST MOMENT When a big Aussie family comes crashing into the resort "just to use the pool," chugging beers, scolding brats, and making a mess. Ah yes, the outside world. Who let that in? FAVORITE CHARACTER A local farmer named Putu, whom I met on a short unscripted hike. He showed me his captive civets (nocturnal, foxlike creatures, also known as luwaks), then served me a cup of kopi luwak, the most expensive coffee in the world. It's made from the beans eaten, digested, and passed by luwaks. You can also order a cup at the resort, which uses beans gathered in the wild rather than from force-fed "pets"—if that makes you feel better about drinking poop java. LOCAL LORE With all due respect, Hindu mythology can be baffling. I asked about a local ceremony and received a story about an ancient king trading his favorite dog to an old man in a secret cave for some snake skin. For this reason, hundreds were lighting incense on the beach. Making conversation, I tried to explain about Jonah and the whale, but people thought I was crazy. WHAT'S GREEN While the region is renowned for its coffee, in recent decades farmers have switched to lucrative hydrangea flowers, which require clear-cutting and can cause catastrophic soil loss. Not good on a small, volcanic island. 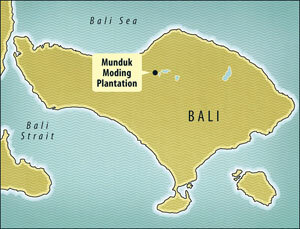 Munduk Moding Plantation encourages locals to return to growing coffee by contributing up to 500 trees a year to local farmers for the propagation of indigenous coffee crops.